I may be a bit behind the band wagon here. Kefir was something I had read about on the other “crunchy” blogs that I enjoy reading, but I didn’t know where to get my hands on the grains. And then the kefir rage suddenly seemed to sweep up around me and every grocery store in town was selling premade kefir. So I bought a bottle and then another and then another. Hubby wouldn’t try it at all (silly Homestud get over here and drink some kefir!) but I grew to really love it. Especially the mango one. Until I turned it over one morning to read how much sugar was in it and just about fell to the ground in pure shock. I should have known to read the label before buying it, but it was supposed to be healthy. I did a silly thing and assumed it wouldn’t be that bad. Stupid April, stupid stupid! And so the kefir spree ended in our house. There was darkness for almost a year. My sister’s mother in law just so happened to be making milk kefir and she was up to her eyeballs in kefir grains. And then there was I, up to my eyeballs in milk and not a kefir grain to be found. Our glorious reunion meant the beginning of a wonderful probiotic journey, right in my own kitchen. I finally got my grubby little paws on some kefir grains and all was right with the world again. But thus so has been the milk transformation. This post contains affiliate links. Should you make a purchase through one of the links I have provided I gain a small commission at no extra cost to you. This goes towards keeping this blog running so I thank you! Kefir is essentially fermented milk. And before ya’ll go turning your nose up at me, allow me to say that it is almost the same as yogurt. Kefir grains are not actually a “grain” at all. The are made up of bacteria and yeasts that break down the lactose in the milk thus making it more digestible. Kefir is the best source of probiotics there is and has many gut healing benefits. (source). I’ve said it many times, true health comes from the gut, so you best show it some love. Kefir love. 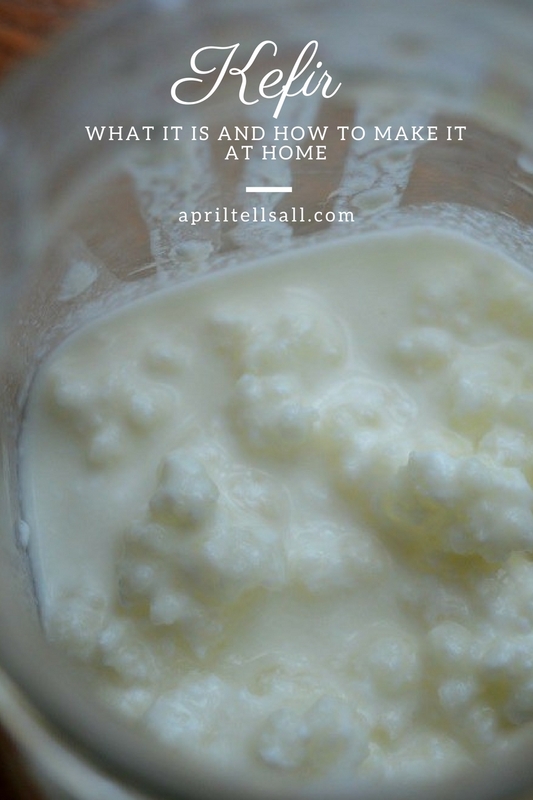 Making kefir is very simple – once you get your paws on some kefir grains that is. There are several places you can buy it online, or hunt out a kefir brewing friend. Much like kombucha, kefir grains multiply over time and eventually you’ll have too many grains. So share the health I say! Just be sure you are getting kefir grains and not a kefir starter. If taken care of properly the grains will last you a lifetime, while a starter eventually dies off. To brew simply add about 2 tablespoons of kefir grains to 1 litre of milk, cover with a towel (it needs to breathe) and wait about 24 hours. Your wait time might be less due to the temperature or how fast acting your grains are. If your kefir has started to separate into curds and whey when you strain it or if it’s lumpy then you’re leaving it too long. It should be just a little thicker than regular milk, but thinner than yogurt. Once the time is up strain the thickened milk through a plastic or nylon sieve to collect the grains, then move the grains to a new jar and pour some more fresh milk over them. See? Simple. Every 24 hours you’ll have another fresh batch of kefir, so best to get drinking. Need to take a break for awhile? No problem. 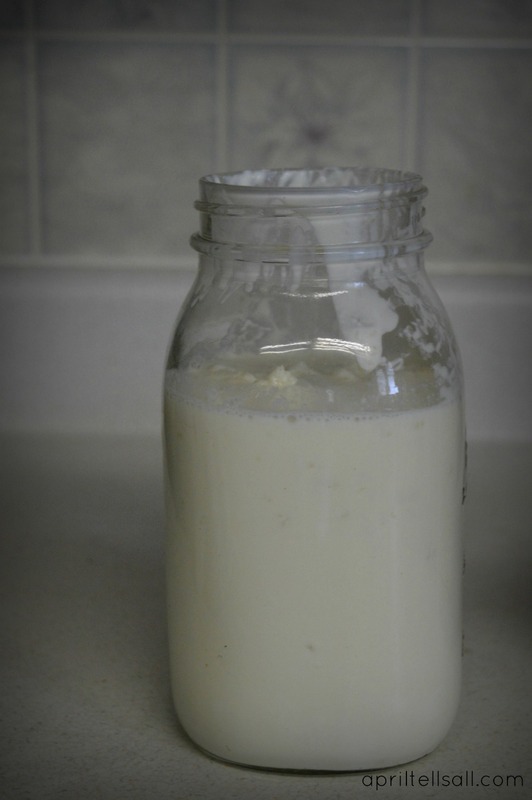 Simply put the jar in the fridge when you add the fresh milk to your grains. They can hibernate for up to 2 weeks like that. Just a few extra things to add. Don’t touch the kefir grains with any metal. Metal will kill the grains on impact. The sieve I use is a plastic one, or you can use a nylon one like this one. I use a plastic spatula or wooden spoon when working it through the sieve. You can make kefir with any mammal milk: cow, goat or sheep. There is some debate on whether coconut or rice milk can be used, so if you’re looking for a vegan option I suggest looking into it. 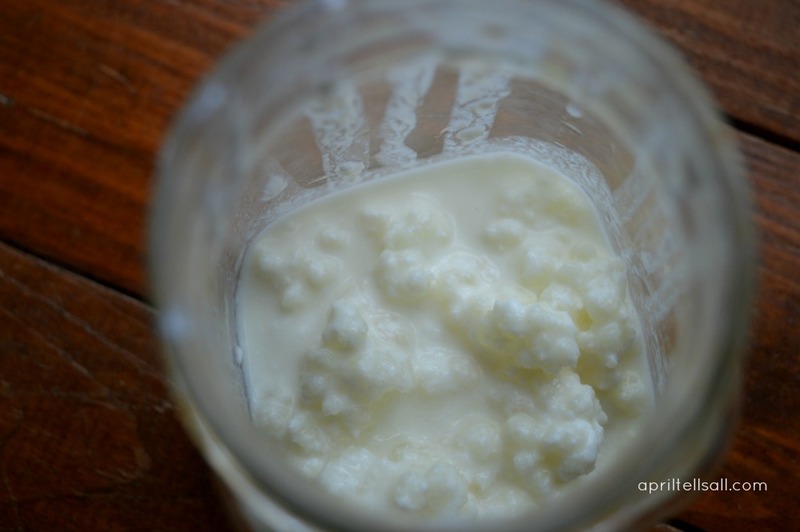 As for us, raw goat milk has been making a fantastic kefir. ….Even if Hubby won’t touch it. So get searching for grains. Or come visit me and I’ll give you some! Your gut will be happy. And so will your wallet, since it is so much cheaper to make your own. Especially if you have your own dairy animal. Oh darn, there I go again pushing the backyard goats. Seriously get goats. Or a cow. Actually get the cow. Goats are jerks.